I hope to grow both as a pianist and as a human being, and to keep making music in the hope of bringing happiness to the world. I need your help, so please give me a chance! Hello, Everyone! Thank you so much for taking your time to read this. My name is Misaki Saito. I have been studying in the United States for 8 years, and am currently a graduate student at the University Of Southern California Thornton School Of Music pursuing a Masters of Music degree in Piano Performance. First, I came to the United States to attend the Interlochen Arts Academy, which is one of the top arts boarding high schools in the US. Because the tuition was fairly high, my parents told me that I could study abroad for only a year. Luckily, I received a huge amount of scholarship from school, and I could graduate smoothly. 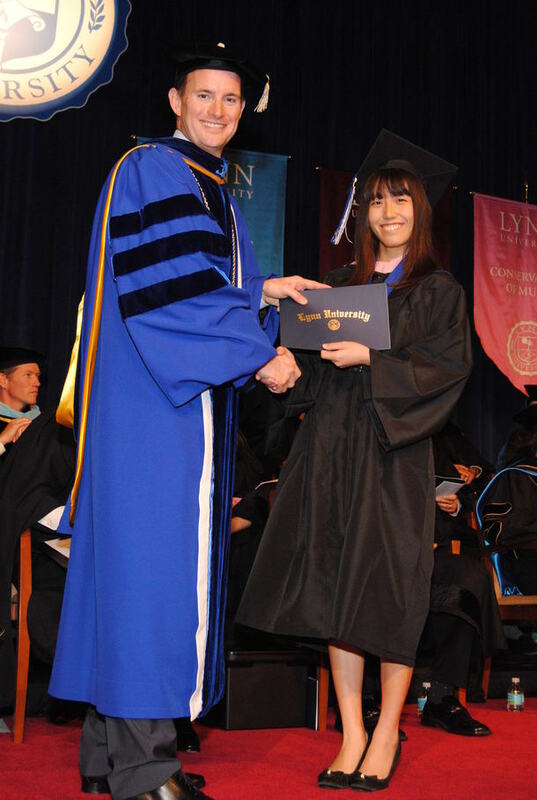 Then I received a full-ride scholarship from Lynn Conservatory of Music for 4 years, so I was fortunate to complete my Bachelor’s degree without relying on my parents’ financial help. Then, I moved forward to pursue a Masters of Music degree in Piano Performance at the University of Southern California, Thornton School of Music. After I completed the first year, I had to take one year off from the school due to my financial issues. The reason why I decided to study abroad was that one of my teachers told me that I have a talent for music and I should not quit playing the piano. At the age of 15, I was busy preparing for the competitive entrance exams for high school in Japan. During the summer, I had an opportunity to perform in a local concert hall; I invited my English teacher to the concert. Although she was an assistant language teacher, she was graduated from the prestigious Eastman School of Music in Cello Performance. After she listened to my performance, she came up to me and said “You should never stop playing the piano, you have a talent!” At that time I was dreaming of working for the United Nations and I told her that I wanted to study English harder, so she suggested I attend an arts boarding high school in the United States, to study English and the piano at the same time. I have experienced many miracles through music, and I started to have a strong feeling that I want to pursue music as a career. After I graduated from high school, I had a solo recital in Japan. There was a person who really loved my performance and immediately became a huge supporter of mine. He arranged a recital every summer when I was back in Japan. The person passed away a few years later; he was fighting with cancer for almost a year. I have never had felt so uneasy, because I wanted to play more for him: I wanted to get even better and perform for him as much as possible since he was one of my biggest fans. After his passing, the wife thanked me dearly. “My husband was listening to your music until the day he passed away. I’m sure he was happy that he met you and listened to your music until the last. I cannot thank you enough what you have contributed to his life.” While he was fighting for cancer, he stayed home instead of a hospital, and listened to my recording every day; it was one of his ways to calm down during such hard times. I never thought that my music could affect someone’s life, and particularly because of this experience I decided that I should pursue music as a career, hoping that my music would mean something or make a difference to people. Other than that, I have a friend who was suffering from hyperventilation, but her illness got better after listening to my recording. And there was another time when I had a concert in a hospital, immediately after I finished performing, a nurse brought a man in a wheelchair to me and he held on to my hands very tightly as many tears were coming out from his innocent eyes. He was not able to speak, and I did not find out until later that he was brain dead. I was in complete shock after the nurse told me that, but I knew the music spoke to his heart and it gave him something special. Until now, there were many people who have told me that my music helped them in some ways, and were moved by the music… and there are many supporters who always come to my concerts even though they live very far away, just to listen my music. These are the moments I feel so grateful that I have been playing music. I would like to study and grow more as a professional pianist at a one of the top-leading music institutions, University of Southern California Thornton School of Music. After completing my Bachelors degree, I came to study at the University of Southern California which is one of the top-leading music institutions in the world. The professor I’m studying with right now is Professor Daniel Pollack who is a world-renowned pianist (1st Tchaikovsky International Competition Winner) and an educator. I feel that I have grown so much throughout my first year from studying with him, and being colleagues with many talented artists from all over the world was a challenging and inspiring experience. However, attending USC Thornton School of Music is extremely expensive. During my first year, I borrowed a vast amount of money, a loan of $40, 000, from the Japanese government, and they would not lend me any more for the second year. Since last summer, I have been working very hard doing multiple part time jobs unrelated to music. One job starts very early morning, and the other one in the evening, so that I have limited time to practice the piano during the afternoon. From all the money which I earned and have been saving, I could pay off my living fee and part of the tuition, but it is still not enough… I really do not want to give up at this point, as my hope is to complete my Masters Degree in music at USC and still continue my studies in order to be successful in my music career. Although music is not visible to our eyes, I believe that music has a strong power that can move people’s hearts and souls inside of them, and I want to continue bringing music to people in the hope of making them happy and enriching their lives. I truly believe that music is a strong tool to move people’s emotions. 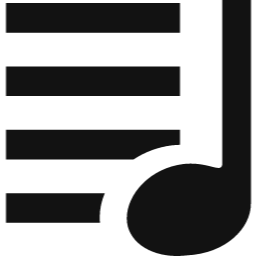 Music can be used to touch so many hearts and help people. I have had many performance opportunities, but the happiest moment for me is when audience members cry or feel happiness after my concerts. It is not that they are amazed by techniques, but that they ‘feel’ something from the music. Music is all about sharing the limited time, space, and the art together, and I feel great joy if I can enrich their life, or their day, even a little. I still want to grow as a better musician, and would be delighted to share my experiences in the field of music, hoping to help make people happier and make the world a better place. Thank you so much for taking your time to read this. I appreciate any of your help, and I promise that I will continue to grow and give back this to everyone. Every bit of help makes a huge difference toward reaching the goal, so thank you so much!! Misaki Saito grew up in Yamanashi, Japan and began playing the piano at age eight. She has enjoyed a variety of experiences playing in communities in the United States and Japan, such as at vocational aid centers, hospitals, nursing centers, and recital halls. Ms. Saito is dedicated to bringing music to these locations in the hope of bringing happiness and relaxation. She is devoted to this calling due to her handicapped sister, who has given her inspiration to express music to all humanity. 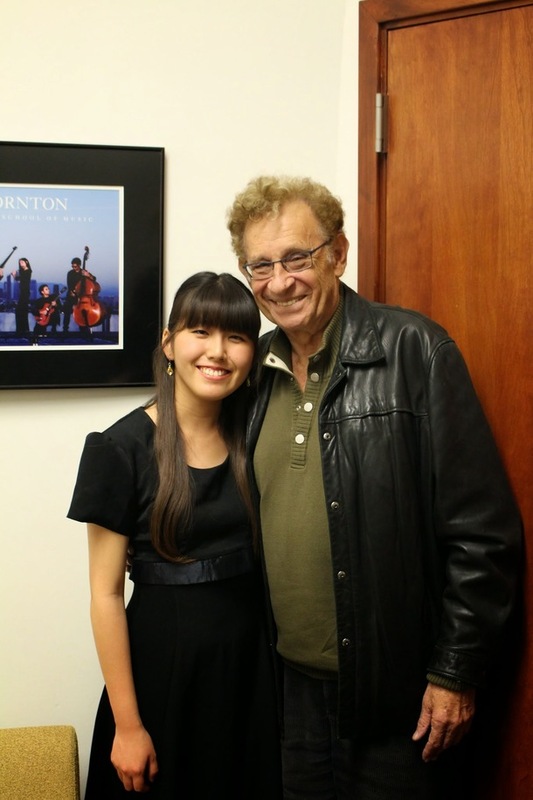 Ms. Saito is now a first year Master of Music performance student at the Thornton School of Music in University of Southern California, studying with the eminent pianist Daniel Pollack. 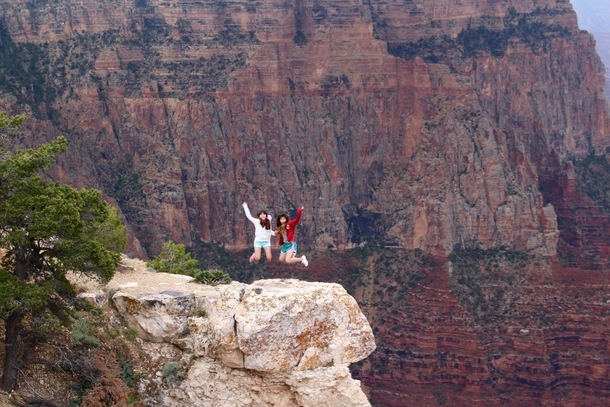 She attended the Interlochen Arts Academy in Michigan from 2007-2010. She attended Lynn University Conservatory of Music on full scholarship with Roberta Rust. 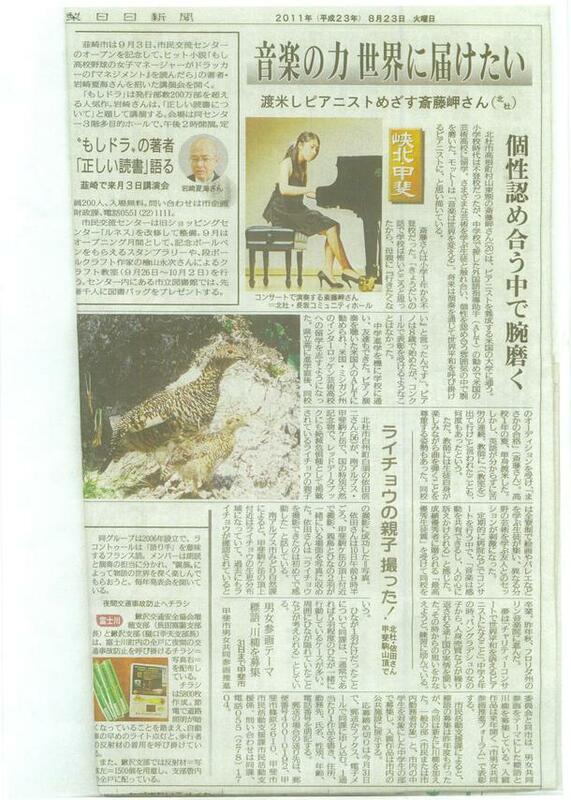 She studied piano previously with Naoko Watanabe, Michael Coonrod, and organ with Thomas Bara. 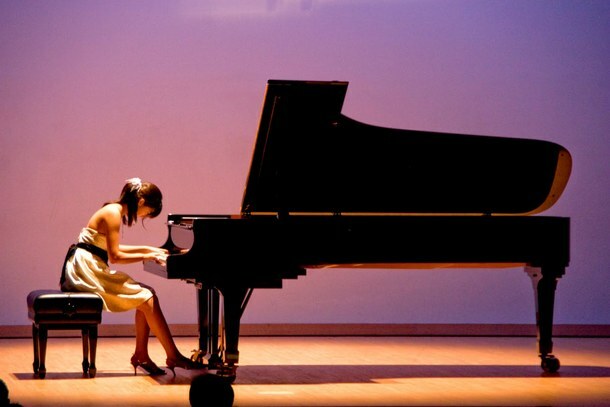 She performed in master classes of pianists Philippe Entremont, Jon Kimura Parker, Rebecca Penneys, Ory Shihor, Brian Preston, Thomas Lymenstull, and Robert Palmer, among others. She also was a participant in chamber music master classes with eminent violinist’s Elmar Oliveira and Midori. She also was a winner of Walenstein Competition in May 2013. 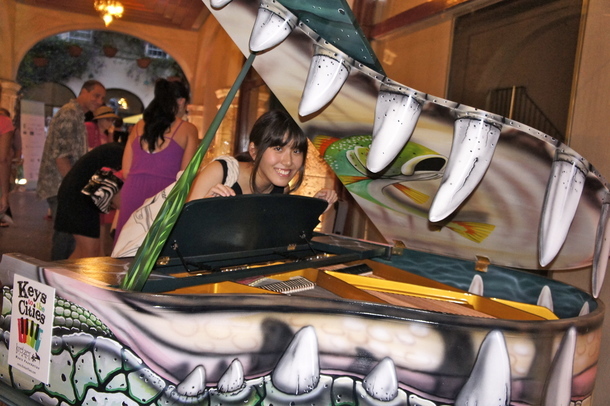 In addition to playing the piano, she developed a variety of interests such as ballet, figure-ice skating, Japanese traditional dance, voice, musical theatre, and ping-pong. She also is a photographer of Getty Images, Inc. I will send you a thank-you letter!! *Just to know that return gifts can be flexible and negotiable, if you do not eat sweets or not really interested in Japanese goods, I will think of another ideas just for you!